Whether he’s designing furniture, interior spaces, or huge art installations, Dambo likes to integrate the people and places around him into all of his work. 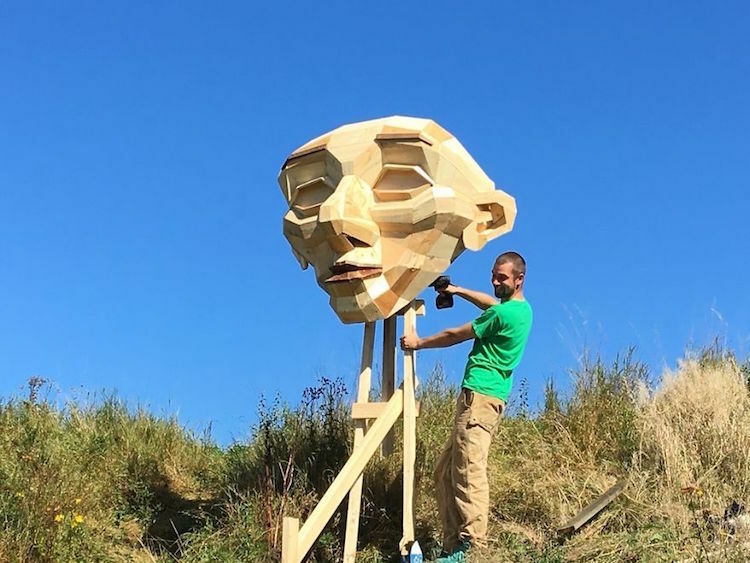 Since 2013, he’s made 25 recycled sculptures that have been placed around the world. His ”Six Forgotten Giants” were completed last year, and they have since been positioned next to boulders with poetry inscribed on them. 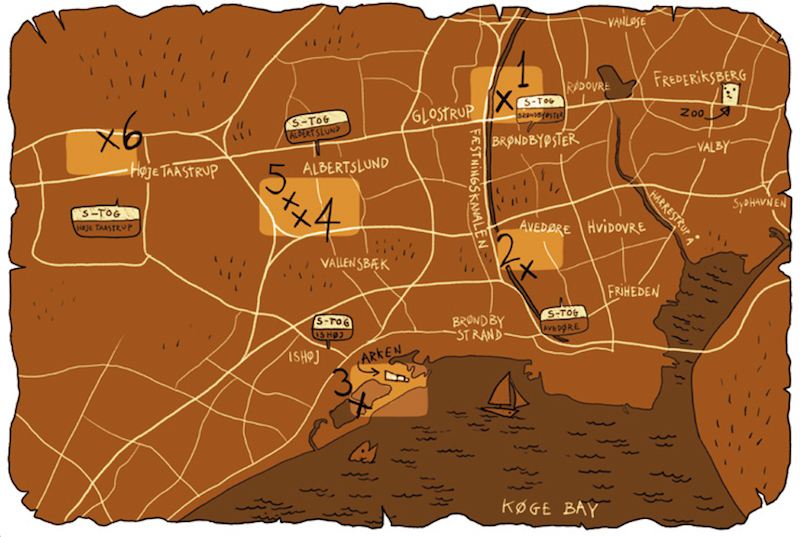 By using these snippets (and a map) as clues, travelers can successfully make their way from one “forgotten” giant to the next. 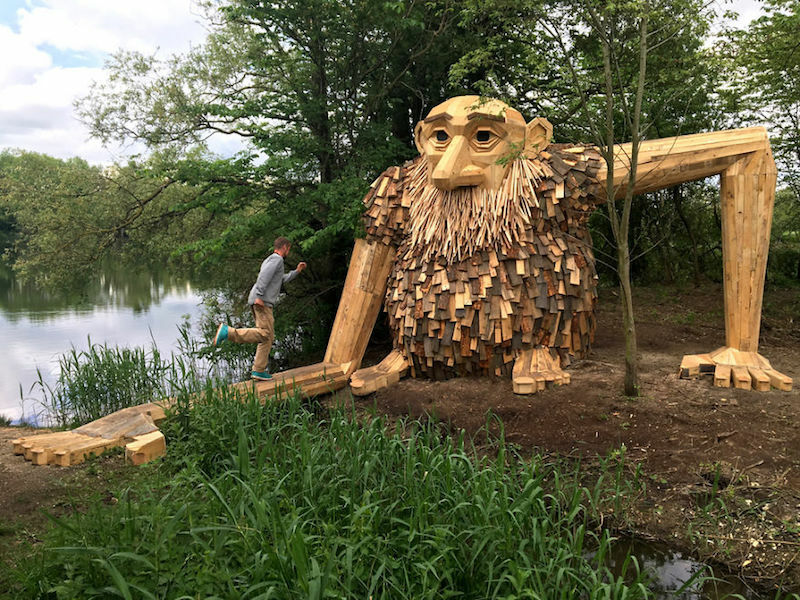 With the help of local volunteers, Dambo made these sculptures out of old floorboards, over 600 wooden pallets, a fence, a watermill, and “whatever else [they were] able to scavenge.” As a token of gratitude to his helpers, Dambo has named each giant after a different volunteer. In Hakkemosen, on the shore of a picturesque lake in Høje Taastrup, ”Teddy Friendly” forms a small bridge with his outstretched arm while sitting on the opposite side of a narrow stream. 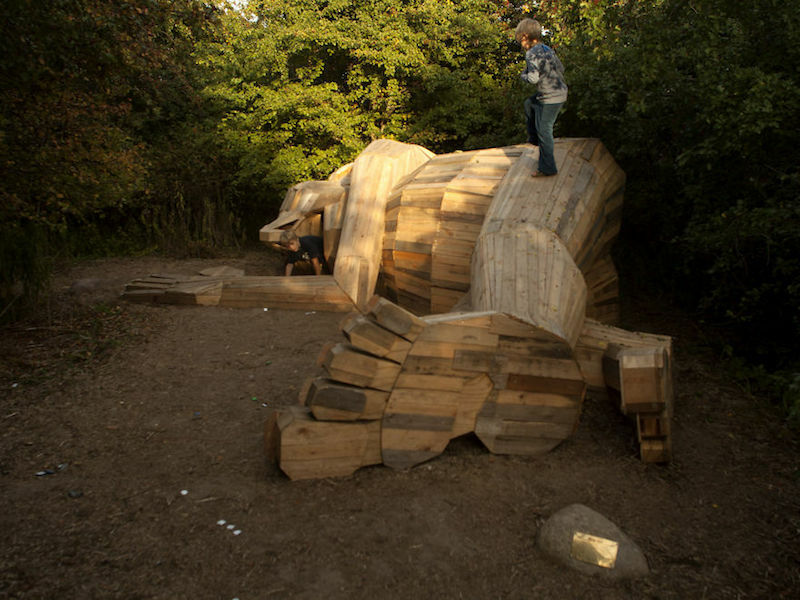 Four unemployed people, and a teacher from a local activation center named Teddy,volunteered to help build this giant, whose fur was made from the cutoffs of locally felled trees. 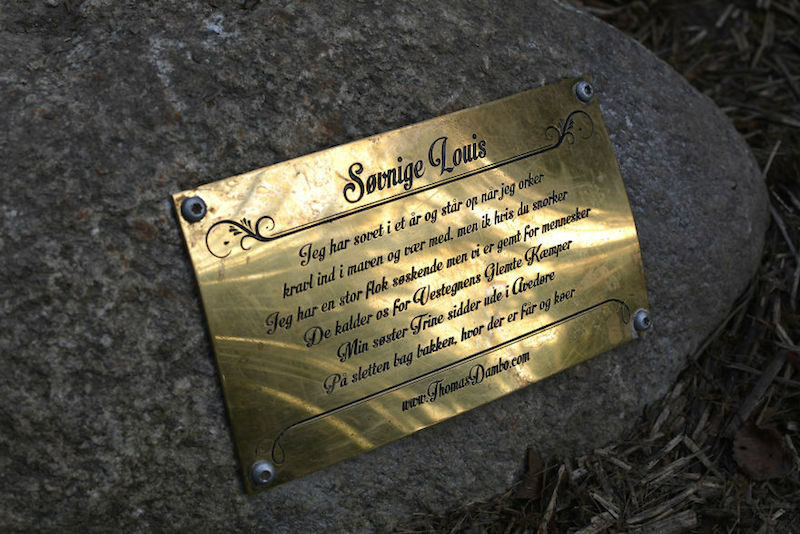 ”Sleeping Louis” was put in a part of Rødovre that had previously attracted a lot of homeless people — food waste, pieces of trash, and old sleeping bags were found scattered across the site. 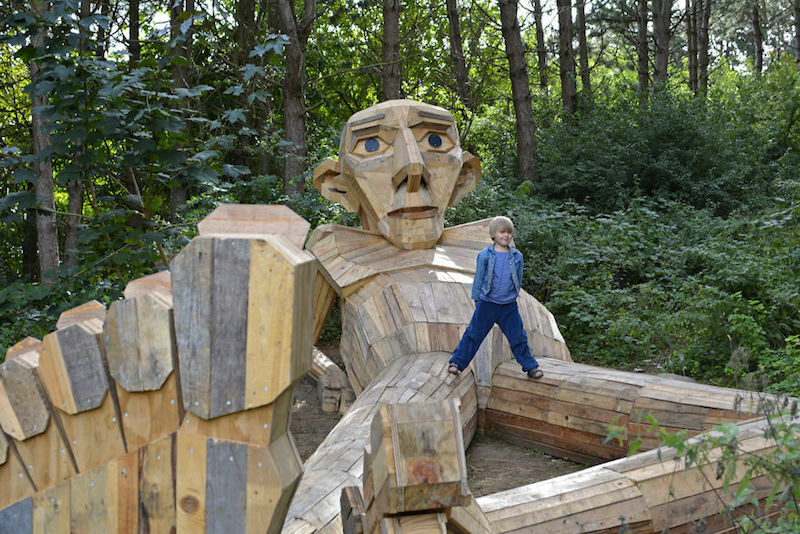 In an effort to alleviate this problem, Dambo hollowed this giant out to allow people to sleep inside of him. The real-life Louis is none other than the artist’s personal assistant, who hails from Bristol. ”Little Tilde” peeks out from behind a tree in Vallensbaek Mose, an area prone to extremely cold weather. Inside Tilde are 28 birdhouses, which were inserted into the giant for birds and squirrels to take shelter in during the winter. Even an 86-year-old craftsman offered to lend a hand in Tilde’s construction! 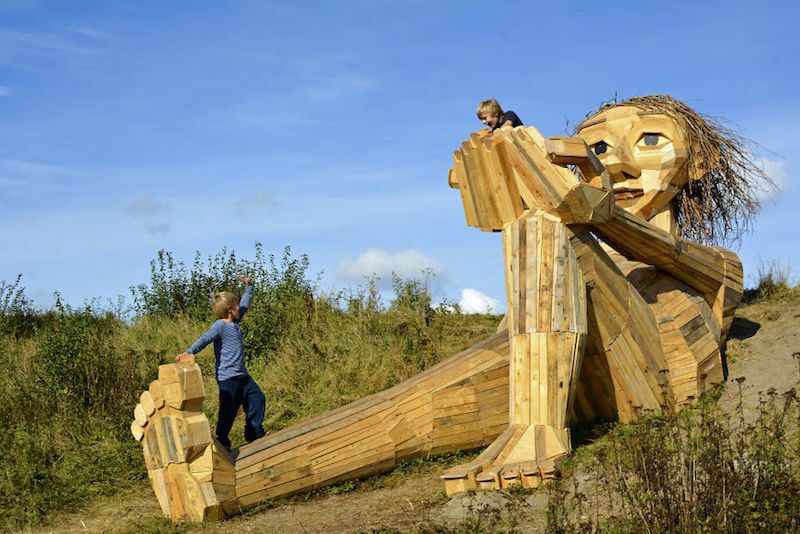 In Ishøj, you’ll find ”Oscar Under The Bridge,” a giant whose fingers clutch the bridge running over his hideout. 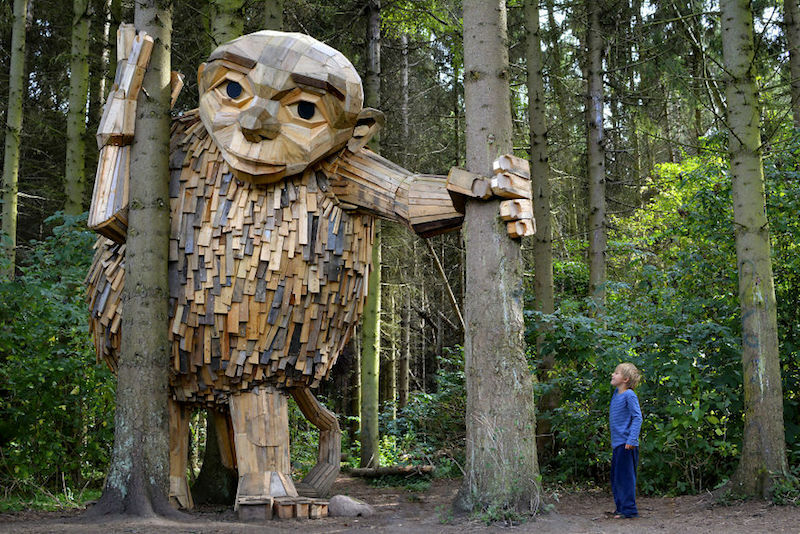 He’s made from the scraps of an old watermill and takes his name from the Chilean artist who helped build him. Elsewhere, two other sculptures provide the perfect vantage points for viewing their surrounding nature. ”Thomas On The Mountain” reclines on a small hillside to look out over Albertslund. While you might think this piece is referencing Dambo himself, it was actually named after an intern who worked on all six Forgotten Giants. In Hvidovre, ”Hill Top Trine” reclines as she overlooks the grazing sheep and picturesque meadows of Avedøresletten. Ultimately, Dambo ”[hopes his] art will inspire people to see the big potential in recycling and taking better care of our planet.